This article was published last year on herb.co. It explains the endocannabinoid system very simple and straight forward. Have you ever wondered how THC works? Well, it just-so-happens to be a similar shape to a compound our bodies create naturally. Thanks to its shape, THC is able to tap into a network in our bodies called the endocannabinoid system. It’s this ability that gives THC it’s psychoactive effects. But, what is the endocannabinoid system and what does it do? To help you understand, we’ve created a handy guide to the endocannabinoid system for dummies. The endocannabinoid system (ECS) refers to a collection of cell receptors and corresponding molecules. You can think of cell receptors like little locks on the surface of your cells. The keys to these locks are chemical molecules called agonists. Each time an agonist binds to a cell it relays a message, giving your cell specific direction. The endocannabinoid system is the name for a series of cell receptors that respond to certain kinds of agonists. 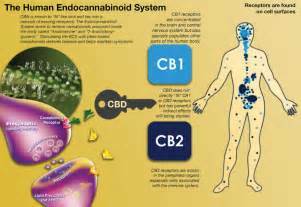 Two primary cell receptors make up the ECS, Cannabinoid Receptor 1 (CB1) and Cannabinoid Receptor 2 (CB2). The keys for these receptors are called endocannabinoids. Endocannabinoids are like the body’s natural THC. In fact, endocannabinoids got their name from cannabis. Plant cannabinoids were discovered first. Endo means within, and cannabinoid referring to a compound that fits into cannabinoid receptors. There are two main endocannabinoid molecules, named anandamide and 2-Ag. Funny thing, scientists wouldn’t have discovered anandamide without THC. Psychoactive (THC) was first discovered by Israeli scientist Raphael Mechoulam back in the 1960s. His finding quickly spurred a rush to figure out how THC worked, and whether or not our own bodies produced a similar compound. More than two decades after the search began, anandamide was found. Yet, once they isolated the chemical, they faced another challenge. What should it be called? They turned to Sanskrit. Anandamide comes from the Sanskrit word Ananda, which means bliss. So, basically, anandamide means bliss molecule. Cannabinoid receptors are found all throughout the body, giving them a wide variety of functions. However, certain receptors are more concentrated in specific regions. CB1 receptors are abundant in the central nervous system. CB2 receptors are more often found on immune cells, in the gastrointestinal tract, and in the peripheral nervous system. Endocannabinoids are the chemical messengers that tell your body to get these processes moving and when to stop. They help maintain optimal balance in the body, also known as homeostasis. When the ECS is disrupted, any one of these things can fall out of balance. Dysregulation in the ECS is thought to contribute to a wide variety of conditions, including fibromyalgia and irritable bowel syndrome. The ECS theory of disease is termed Clinical Endocannabinoid Deficiency. The idea is simple: when the body does not produce enough endocannabinoids or cannot regulate them properly, you are more susceptible to illnesses that affect one or several of the functions listed above. If your body cannot produce enough endocannabinoids, you might be in for some trouble. But, where do endocannabinoids come from, anyway? This question has another simple answer: diet. Your body creates endocannabinoids with the help of fatty acids. Omega-3 fatty acids are especially important for this. Recent research in animal models has found a connection between diets low in omega-3s and mood changes caused by poor endocannabinoid regulation. Fortunately, hemp seeds are a quality source of omgea-3s. However, fish like salmon and sardines produce a form of omega-3s that is easier for your body to put to use. Cannabinoid receptors are often what we associate with the endocannabinoid system. But, the ECS is more complicated than that. Enzymes also have a crucial role to play in the process. In a way, enzymes are kind of like Pacman. They gobble up various compounds, change them, and then spit out the parts. In the ECS, enzymes break down leftover endocannabinoids. Enter non-psychoactive CBD. Enter non-psychoactive CBD. While THC binds with cannabinoid receptors directly, CBD does not. Instead, it works it’s magic on an enzyme. The enzyme in question is called FAAH, and it is responsible for pulling excess anandamide out of circulation. CBD puts a stop to this. Psychoactive THC works by mimicking the body’s own endocannabinoids. But, CBD increases the amount of endocannabinoids in your system. CBD stops enzyme FAAH from breaking down all of the anandamide, and therefore makes more of it available for use by your cells. This is why CBD is a natural mood-lifter without psychoactive effects. This is just a brief overview of the endocannabinoid system. Each year, new studies shed light into what this amazing network does inside our bodies. The discovery of the ECS is what makes medical cannabis such a big deal. People often joke about the herbs ability to heal a wide variety of seemingly unrelated conditions. But, we now understand that these conditions are all regulated in part by the ECS. The medical implications of this finding are endless. Previous post: Anxiety – how can I natually treat my anxiety?